Based on 2014 published data from the bureau of Labor Statistics, 261,930 private industry and state and local government workers missed one or more days of work due ot injuries from falls on the same level or to lower levels. Seven hundred and ninety-eight workers died from these falls. 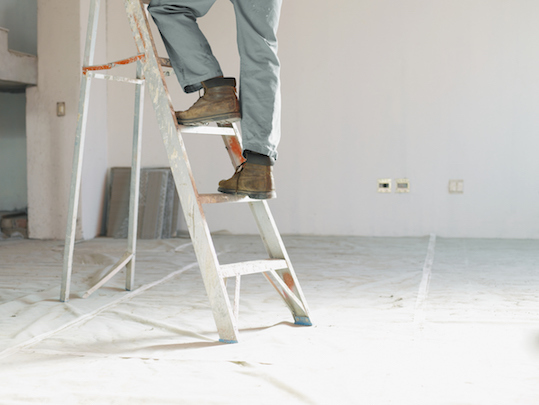 Workers who are male, Hispanic, older, self-employed, work in smaller establishments and work doing construction, maintenance and repair, experience higher ladder fall injury rates. The construction industry experienced the highest frequency of fall-related deaths, while the highest counts of nonfatal fall injuries continue to be associated with health services and the wholesale and retail industries. Doesn't just about everyone have a ladder? And it seems like many aren't following ladder safety protocols. Looking for ladder safety training? Check out the American Ladder Institute. While you're there, earn your Ladder Safety Certificate. Train yourself or your entire team online. Managers can set up a session for everyone in their group. Since it's release in 2013 the National Institute of Occupational Safety and Health's Ladder Safety app has helped thousands of users set up and use extension ladders more safely to prevent falls. The app contains general ladder safety, inspection and selection guidelines and related information. The Ladder Safety app is available for free, in English or Spanish, at Apple Store and Google Play. OSHA also provides ladder safety resources in their effort to prevent workplace falls. To learn more about our Risk Engineering services and to view other resources, go here. Download our Ladder Safety Technical Bulletin. State Auto makes no representations or guarantee as to the correctness or sufficiency of any information contained herein, nor guarantees results based upon use of this information. State Auto does not warrant that reliance upon this document will prevent accident and losses or satisfy federal, state and local codes, ordinances and regulations. The reader assumes entire risk as to use of this information.